We've almost whooshed through another week, haven't we?! In my neck of the woods, Mother Nature's fever broke for a couple of days and it was so lovely to have the Playhouse windows open. Hammy spent most of yesterday with his nose pressed against the screen. He was fixated and fascinated by the comings and goings of the hummers while enjoying the fresh breezes that would blow up his fur knickers from time to time! I've got a long line-up for you today and I know you've got a side dish to make for the barbecue (potato salad? baked beans? 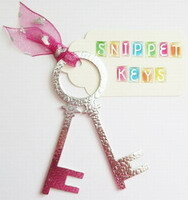 ), so I'll try to keep my ginfers from typing on willy-silly as they are wont to do. The first two cards which feature rainbow tears are a CASE of a card I made ages ago. The designs are simples using the water drops from Designs by Ryn. The "thinking of you" sediment might be from MFT, but I'm not for sure. The "Sending Hugs" is from PTI. Retro Rubber: Over the rainbow. I have had the Water Droplets stamps since 2013! In my last post I made a card that fit the brief at Less Is More, but I biffed it when I wrote my post by submitting it to too many challenges. Slap! I'd already linked to everybody, so I couldn't make a withdrawal. Well, by golly, I decided to make it right by creating another card just for LIM! Sorry you can't really see all the glitz and shimmer of this card because the gold metallic paper is so hard to photograph. To make this "no stamps" card, I took one item from Mt. NBUS (the Cascadia Wreath from Memory Box enabled by my friend Sheri), one item from my UCB box (the gold-splattered-tissue-paper-and-ink background enabled by my friend Loll), and the hello die (also in gold) from WPlus9. And in case you were just drifting off, how about a splash of pink passion?! This card is to celebrate the 5th birthday of one of my very favorite Clean and Simple Challenges: CASology! Congratulations to Melissa and everyone who has been a part of her team over the last five years! Cheers to many more years! There is a sponsored (meaning prizes!) Blog Hop happening at CASology and the theme for this birthday celebration is "Balloons." 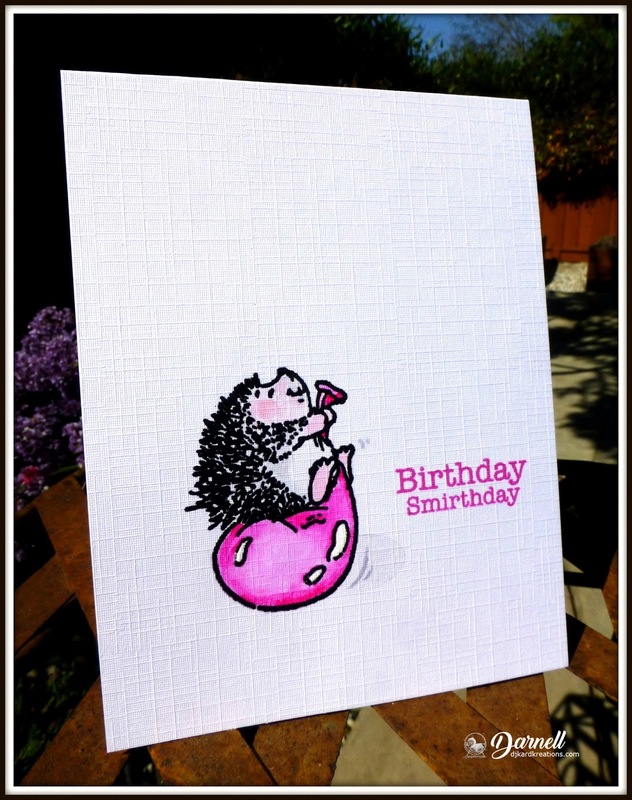 I wanted to come up with a design that included a critter, so Hammy immediately thought of this old, but well-loved, Penny Black hedgie stamp which I heat embossed and painted with my Ziggies. The sediment is from Technique Tuesday. Cards in Envy: Baby blue or pretty in pink. The Challenge: Black and white and one other color. Double D Challenge: Black and white with a pop of color . 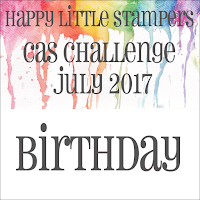 Happy Little Stampers July CAS Challenge: Birthday. I liked it so well in pink, I made one in blue. I think I might make a batch of these in every color. I forgot how much I love that hedgie's happy little face as he's bouncing his balloon across the floor! I'm pretty sure he is letting some air out every now and then to make fart noises and then giggling historically! It's a wonder he hasn't fallen off! 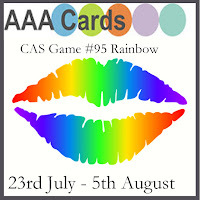 The rainbow tears cards are gorgeous - sure to cheer somebody up. Hi Darnell, The cards are fab as usual. I particularly like the tears ones. A fabulous collection of cards here Darnell, I love the gold hello especially. As usual it was a delight to read your post while my husband was preparing the barbecue AND the side dish ! Gorgeous cards and I really love the one you especially made for LIM ! What a gorgeous background for this stunning gold wreath! You rock again ! Thanks so much for sharing and for playing along at Less is More! Your posts never fail to make me smile - a great selection of cards today as well. The rainbow one is effective but a fave has to be the hedgie bouncing along on the balloon (with sound effects I'm sure). Wow, you have been busy! All stunning creations. I did giggle at Hammie's fur knickers, think he must be a bit toasty in this weather, poor thing! WOW,WOW,WOW!! Your cards are gorgeous! I especially love the tears card! 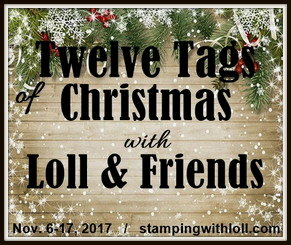 Fun fun post with fabulous cards!! Love each and everyone of them, from the elegant to the fun and cute cute hedgie!! amazing cards friend! Love your little hammy's in pink and blue...I think a rainbow color of them would be awesome!! Your gold wreath card is stunning, love it!! And let's not forget the amazing water drops...you are just so clever! Glad you get a little bit of weather reprieve, love open windows and fresh air blowing in...we are getting a lot of hot weather here too and I am kind of loving it! I am off tomorrow for my big trip to the Mediterranean...so excited!! I will be missing in action for about 16 days, so don't think I am ignoring you! Your cards always make me smile Darnell! What a cute creation for our challenge! Thanks so much for joining in the fun at our Double D ‘Black & White with a POP of Color’ challenge! We hope you’ll come back often. Might be a long lineup, but I love them all, and sure do adore that Birthday Smirthday sediment! Excellent concoctions! Hahaha! I'm laughing about that comment on the little hedgehog! Superb display of cards Darnell I miss a deadline for a challenge today... I need a little Hammy to remind me I think. I hope you are feeling good... Sending hugs your way! Wow! You were really on a roll with all these fabulous cards! Way to go...thanks for all the beautiful inspiration! I'm glad you are having some cooler days and I see you are enjoying the playhouse. I love all of these cool cards today. The hedgie's are adorable and would be cute in every color. The gold is stunning with that gorgeous gold touched tissue. I love that. And those water drops really are my favorite. By the way, I am bringing deviled eggs to the bbq. What time do we eat? Their designs are awesome and very wonderful. Especially love the gold wreath one as I am a Magpie sort of person. I adore those drips...now, especially, in rainbow hues. Makes for a CAS card with HUGE impact. You really did Loll's tissue technique proud. It looks glorious with that golden, viney wreath. Inlay is always beautiful, to me. The hedgie is also one of my favorites I totally forgot about. Just so cute bouncing on that balloon and perfect for CASology's anniversary. Wow, wow! So much to see! It's kinda easier to put it all in one post, isn't it? Those rainbow tears are awesome. Love both designs, and especially loving the simplicity of the sentiment placement on the first card. Sometimes it's the smallest things that grab me. 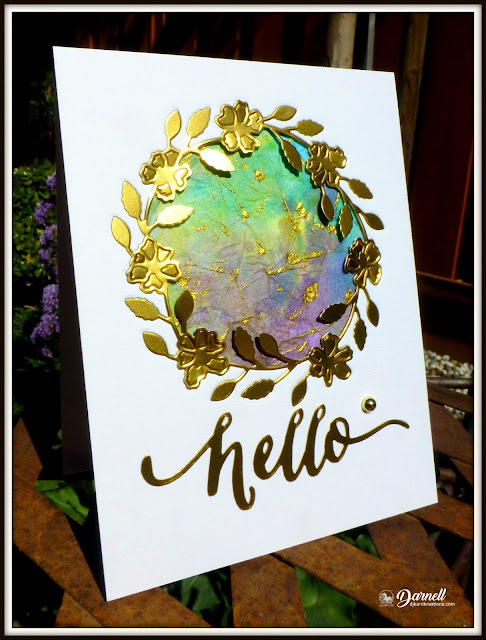 Incredibly gorgeous gold wreath and tissue panel with the fabulous, large "hello". So beautiful! Finally, I good good giggles from the last two cards with the hedgies bouncing their balloons. I'm sure at least the boy is making fart noises with his. Hey, we had a big birthday bash for my mother-in-law yesterday who turned 94 and I did make homemade potato salad with sloppy joes and lots of other goodies. 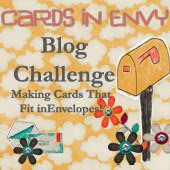 Your Birthday Smirthday card is perfect for the Cards in Envy challenge. Thanks so much for joining us. A plethora of fantastic cards Darnell...and I agree that the hedgie is enjoying all the noise he can make as he bounces about. Wow, a bunch of awesome cards. I really loved the gold wreath card. So gorgeous. Have a great day. Loving the rainbow tears and the wonderfully CAS layout of your first card. Think I might just have to borrow that one at some point. Thanks for playing at AAA Cards. Lovely cards Darnell. Each one has its own perfect design and colors. Thanks for sharing. Such beautiful cards Darnell!! I love the tissue paper technique. The rainbow tears cards are very creative! Rainbow tears, they look really great but thank goodness it is only an art thing, just think what a mess you face would look like if we did cry rainbow tears, talk about a distress background! The gold wreath looks stunning against the lovely background. Two really lovely hedgy cards, love the LIM style. I remember your card with Ryn drops, a few years ago. It was she who made me start following your blog :-) Remake is just as perfect! And I love the second card, it's so elegant. Gold must shine amazingly. The next card with a sweet hedgehog made me smile. And although I love blue, I'm not able to pinpoint which card is more beautiful! Love your rainbow drops, Dolly! And the hedgie with the balloon is fun in pink or blue! What a wonderful array of great cards. You really have been busy. 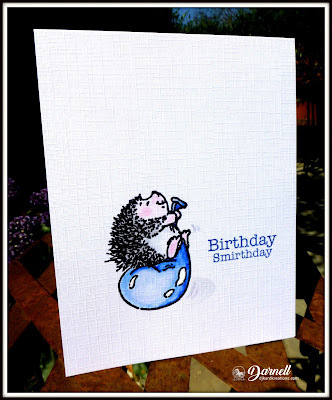 I think that hedgie card is so darling and looks great in both pink and blue. All of your cards are beautiful! 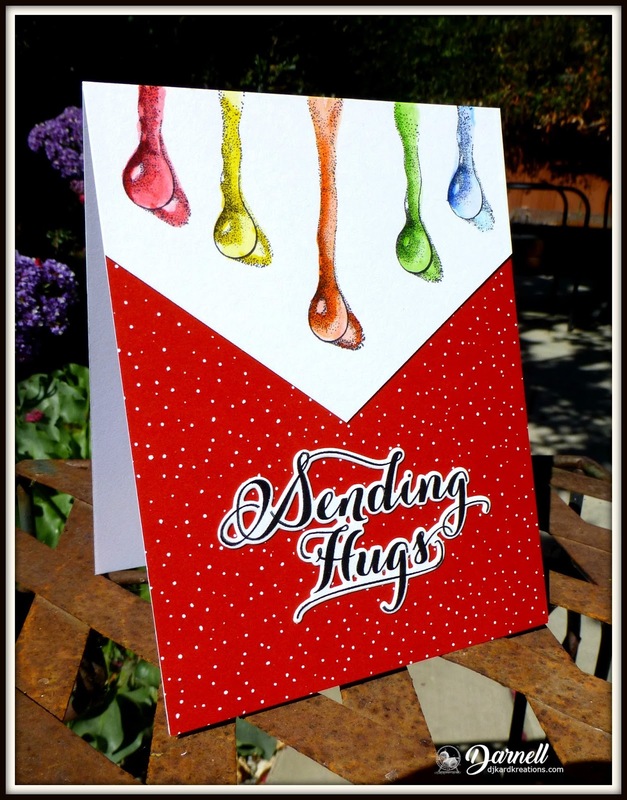 Love the simplicity of your rainbow card and the shimmer background in your hello card. Thanks for sharing at AAA cards. Drippy little rainbow water drops, a fancy shimmering gold wreath and happy little hedgies...what could be better about this post!! Love the variety Darnell and all perfectly executed. I can just hear the high pitched air squealing out of those balloons!! Darnell, oh my! Your cards are gorgeous....I can't just pick one! Great take on the challenge. Thanks for joining Retro Rubber. The rainbow tears make me think of a crying unicorn. That's what her tears would look like, right? I love the hedgie cards. That truly is the happiest little hedgie ever...bouncing along on his colorful balloon. I think purple would be a great color to add to that collection of cards. Terrific post, Darnell! I seriously love the balloon holding hedgehog! Thanks for playing along with the CASology anniversary challenge this week! Oh, good grief woman! - you spoil us! So many fab makes today - LOVING your rainbow droplets and your LIM entry and .... you get the picture!? 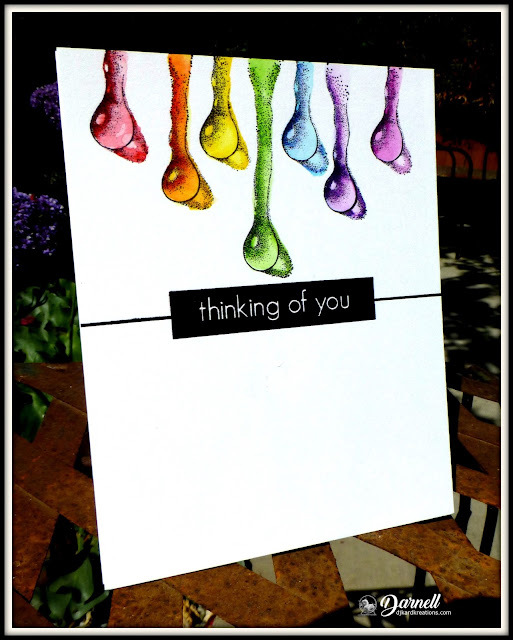 Love your rainbow droplets. I can vaguely remember seeing them once before but this time they kind of registered in my head as something I would love to do myself. Would you mind? I think I am in a "Colour mode" at the moment, having a passion for things bright and beautiful. So you see your pink passion at the end has certainly grabbed hold of me. Not that I had to be awakened as I was drooling over your golden halo and the lovely greens inside of it. Such beautiful cards - thanks for sharing. BEAUTIFUL creations! I am loving your CAS Hedgehog birthday cards! Classic look with great POPS of color! 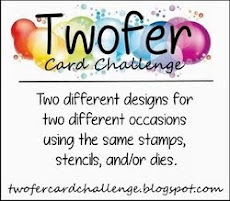 Thanks so much for playing along with us at The Double D Pop Of Color Challenge, Donna, DT Member. What a lineup of beautiful cards, Darnell! The rainbow drops are sure to make anyone happy... I am happier now :)! I love all your cards, Darnell. I like how you CASE yourself! We got a little break from the oppressive heat, too & loved it! Wonderful cards today, Darnell--absolutely love the golden wreath with the beautiful tissue paper--stunning! Darnell, I've been too long away from your blog! I'd forgotten what a ray of sunshine your posts are. I think your rainbow tears are simply glorious! It's a lovely, clean design. Thank you so much for joining us at Retro Rubber for our rainbow challenge. Your hedgie definitely has a naughty grin so that must be what he is doing. I love your gold and chiffon concoction. So starry and elegant. These are all FABULOUS, Darnell! I just love that little hedgehog on the balloon...I just may need to add that to my stash. ;) And those water drops are simply awesome! Love them in the rainbow of colors! Also, let's not forget your beautiful wreath card...the touches of gold are perfect! What a wonderful assortment of cards, Darnell. Your rainbow cards are fantastic, and I truly adore the cutie you made for our anniversary celebration at CASology. Thanks so much for playing along. Such an amazing collection of cards Darnell, all stunning. I love ALL of your pretty cards today! Guess what? On June 24th, I sent you a lovely birthday card, all the way to the West Coast, in order to reach you by your birthday! TODAY, the card was returned back to me, after all this time, unopened, with a yellow return to sender sticker on it! I would love to resend it to you, since this was a special card that I think you'll recognize! You were /are so nice to me earlier this year, and I feel terrible if you thought I had forgotten your birthday. I'm at crimsonowl@chartre.net. Could you drop me a line and send me your current snail mail address? Happy VERY Belated birthday! The water drops caught my eyes and brought me to this post with your gorgeous creations!!! Love the beautiful tissue paper and the happy hedgie on the ballon, too! Fabulous set of cards, Darnell! Such fun and beautiful drops of rainbow colors. Thank you for sharing with us at AAA Cards. Beautiful cards, Darnell! I'm intrigued with the rainbow colored drops but that hedgie has my heart! The stamps are soooo cool! Love this! Thanks for joining the RR challenge! You did it again and made me laugh with your writing! And your cards blew my socks off (wait I'm not wearing any, it's summer)! The rainbow raindrops are spectacular, the same goes for the golden wreath card, and the hedgehog cards are super cute! WHat a great selection of cards! The rainbow water droplets look amazing!!! Such cool cards! I love wreath cards and your is stunning! So smart to make multiples of cards. Fun to have pink and blue cards! Awesome cards! Thanks for sharing them with us at Cards In Envy! Congrats on the Top Pick at Retro Rubber for your creative card, Darnell! Hope you're staying cool--getting to be a difficult task up here! Awesome cards, as always, Darnell! The rainbow of tears is such a unique card and so pretty! My fave is the golden hello card--love the tissue in the middle of the wreath! Beautiful! Send some of that cool air to Texas please! LOL! Hugs! Oh Darnell, your cards are so fun and I love the designs! Your rainbow tears remind me of the hands that stick on surfaces! Fabulous cards Darnell but your CASology card makes me smile. I can feel the happiness in your little critter. So glad you joined us for the CASology anniversary celebration! FAB cards, Darnell! I absolutely love the rainbow tears! Awesome! Those hedgie cards are so drn cute! I had not seen that image before today! Your golden card is super. Lol's background so beautiful and your gold additions are perfect here. The raindrop cards are lovely too! PS It was great to see you using a NBuS...after all you inspired me. We are well over half of this year and I have been able to stick to my goal of at least one NBUS item on every card in 2017...yay! Such pretty cards, Darnell, and the rainbow teardrops are something I haven't seen before! Thank you for sharing these with us at the Simon Says Stamp Wednesday challenge! Wowzers girl...you're on a roll here! These cards are SOOOOOOOO awesome! I must be living under a rock (not must...I do live under a rock) cuz I've never seen this tear drop stamp before. 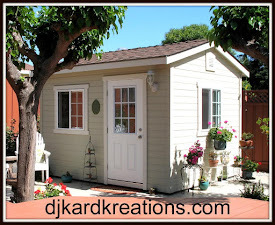 The bright colors that you used will definitely make the recipient smile. The little gold number is definitely a runway hit! The colors inside the breath are gorgeous, especially with the flicks and flecks of gold mixed in. The 'birthday smirthday' cards are beyond adorable and definitely stole my heart! Love all the white space (who me?). Wowsers, so may beautiful creations Darnell!!! I love the rainbow tears and I can't get over how perfectly CAS your hedgehog cards are - they are sooooo adorable. You are such an inspiration! It's colder here too and what a blessing--even got a good night's sleep. Your creations are wonderful! The rainbow tears are so lovely as is the gorgeous gold. Your hedgehogs are so adorable and yes, definitely need them in all colors! Those little Penny Black hedges are my favorite!